Perfect for large gas and charcoal grills (won’t douse charcoal fires)–the Grill Daddy Pro is the original “Revolutionary Grill-Cleaning Tool” that cleans big grills in minutes…with the power of steam. No scraping needed. Easily steam away baked-on food, grease, and black residue. And best of all, brushes won’t gunk up. Specially designed to clean and sanitize grills safely and thoroughly, the Grill Daddy Pro keeps all grills looking brand new and keeps food tasting great. The amazing Grill Daddy Pro releases a measured amount of water that turns to grease-melting steam the instant it touches your preheated grill. This powerful sanitizing, liquefying action literally melts away charred buildup. 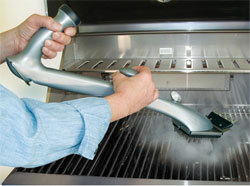 Just glide the stainless-steel brush along the grill. Use the double-duty scraper brush for tough grime and hard-to-clean areas. Unlike any other brush, the patented Grill Daddy Pro is made from high-temperature heat-resistant ABS plastic and approved by the National Safety Foundation (NSF) for use with potable water. 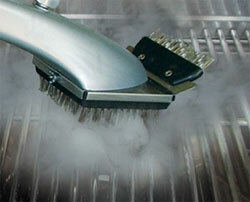 Brush heads are dishwasher-safe and safe to use on stainless steel, ceramic, and iron grills. Grill Daddy Pro is a Must for Large Grills Before and after: Grill Daddy Pro gives you a sparkling clean grill in minutes. At 22 inches from end to end, the Grill Daddy Pro is the longest grill brush on the market. It is specially designed to protect your hands from grill heat while cleaning large hot grills and features two ergonomic handles that provide maximum cleaning leverage even when cleaning the back of big grills. Plus, with its 2-cup water capacity, the Grill Daddy Pro delivers tons of steam to clean even the largest grill without having to refill. The Grill Daddy Pro will also keep its beautiful silver surface for years to come, as it is UV stabilized to withstand the elements. A must for winter grilling. Simply preheat the grill, fill your Grill Daddy Pro with water (water valve should be in the off position while filling), turn on the water valve and brush away caked on food residue and grease. As you brush, the Grill Daddy Pro releases just the right amount of water; the water hits the hot grill, turns to steam, and rinses away burnt-on food, grease, and grime. For more steam, loosen the fill cap. For hard-to-clean areas, flip the brush over to release water from the patented scraper brush and use the scraper brush in a cross-wise direction to bust-up and melt-away even the most stubborn, baked-on residue with the power of steam. No more toxic chemicals. No more back-breaking work. The Grill Daddy Pro gives you a sparkling clean grill in minutes. Equipped with a handy hang-hook, the Grill Daddy Pro can be conveniently stored away and ready to go when you are. Note: After each use empty excess water and leave the On/Off Valve in the on position. Built to last with their heavy-gauge stainless-steel bristles, these brushes can really take it. They’re dishwasher-safe and guaranteed not to gunk up. And they easily pop on and off. Plus, there are five specialty attachments (sold separately), each designed to deliver maximum cleaning power. Look for them on Amazon.com. So much potential! Just needs to be better built What a simple, yet brilliant idea. Have a hollow grill brush, fill it with water and when your grill is nice and hot scrub it down. The water steam cleans the grill with a continuous flow of water. The only problem is the device is made of brittle plastic. Mine broke after the first use. I’m giving it two stars because it is such a great idea. Hopefully my replacement lasts a lot longer than one use.